The year is supposed to be one full of powerful energy and productivity. What an inspiring forecast! I’m helping the mystical Dragon along by attacking my personal resolutions with vigor. 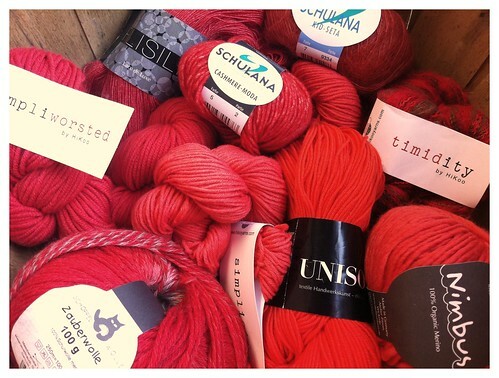 Yarn is my life, and here at Skacel, we ADORE a strong red. I didn’t have to search very hard to find a gorgeous selection of this elusive but incredibly dynamic shade. Pictured above, clockwise from left: HiKoo Simpliworsted in #16 Gypsy Red, Zitron Filisilk in #3004 Red, Schulana Cashmere Moda in #5, Schulana Kid Seta #7 Burnt Orange, HiKoo Timidity in Gypsy Red/Milk Chocolate, Zitron Nimbus in Tomato, Zitron Unisono Solid in #1159, HiKoo Simplicity in Ghost Chili, Schoppel-Wolle Zauberwolle in #1701 Ombre.